Saint-Petersburg, September 16th, RIA Novosti, news agency. 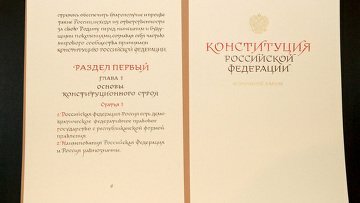 The International Exhibition of Calligraphy is to present the brightest highlight of calligraphy in Russia: the first handwritten copy of the Constitution of the Russian Federation, at the opening in Saint-Petersburg on September 17th, 2008. The total number of exhibits exceeds 350 works by the elite representatives of a variety of calligraphy schools from 24 countries. The organizers share, that the Exhibition will delicately sail you to the world of the past as well as to present-day reality. Today’s collection has 250 exhibits. Among them are the most fascinating, yet unexplored, samples of Slavic writing, historical manuscripts of the peoples of the world, rare letters and documents, belonging to the Romanovs, the noble family of Russia. The visitors will see an excellent gallery of rare, scarce and unseen manuscripts and miniature books from private collections. Besides this, they will see writing materials and utensils of all ages, and will be able to scrupulously examine modern originals and distinct samples of applied calligraphy. Within the framework of the Exhibition, the organizers are holding several master classes delivered by Russian and international calligraphy experts and artists, who will be happy to offer pupils and students a couple of calligraphy lessons. All experts will be offered to visit a series of lectures. Last but not least, the Exhibition Program will feature round table discussions, seminars, calligraphic performances and contests for amateur calligraphy writers.